Plastic pollution kills nearly half a million marine mammals every year, and this is a concern we need to unite to stop from happening. I avoid buying plastic bottled water because it is still water that is not healthy for us, and the water bottles fill many landfills. I am glad companies like R3VOLVED is recycling plastic bottles to create planet-friendly products useful for school, home, and office. For example the bottle eraser and sharpeneraser is made with 1 recycled bottle each, and the foldable ruler is made with 2 recycled bottles. The products are made using recycle plastic and rubber. The packaging of the products is made with recycled paper, and printed with vegetable based inks. This green initiative was started by two Canadian moms, Jacquelyn Cyr and Suzanne Dyment with a mission to make recycled products accessible to everyone and drive a moment to #chooserecycled. Over 6000 plastic water bottles are produced every second of every day. Less than a third of waste is recycled into new products. Most plastic pollution ends up in landfills, incinerators, or the ocean. Plastic bottles take up to up to a millennium to break down in landfills. Plastic incineration releases substantial toxins into the environment. There is an ocean plastic patch twice the size of Texas in the Pacific. BC Hydro reports that 10% of waste in their provincial landfills is office supplies. The products at R3VOLVED are reasonably priced and have been made affordable, as the founders realize in order to make a serious impact on the planet the products need to be accessible and appealing to the average person. 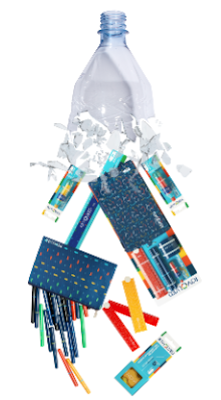 Canadians have a new opportunity to be part of a movement to choose recycled and help divert pollution from landfills by purchasing these colourful items for back to school or for everyday use at Walmart Canada and online at R3VOLVED.com. This is something that really NEEDS to be done!! Hurrah! Lovely items! This is fantastic!! Water bottles are so wasteful and this is a brilliant way to make a difference!! I love this idea and the supplies look great!